Today: To adapt a recipe to be gluten-free, there's a little science and math involved, then you play with flavors, you follow your instincts -- and then you eat. 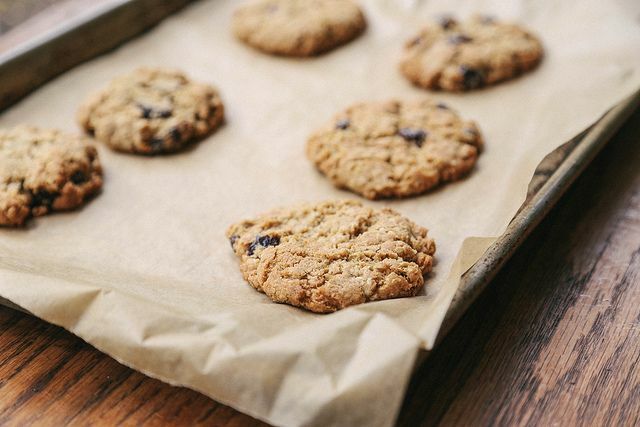 Shauna shows us how while converting a Food52 favorite: Merrill's Crispy Oatmeal Chocolate Chip Cookies. Let's talk about how to make a recipe your own. This one might be tough -- in the age of the internet, the first recipe that pops up from your search might not be a good one. It might be that the team that put it online did whatever necessary to make sure it shows up first in your search. Ever made a recipe online and blamed yourself when it turned out horribly? Don't. It might have been poorly written. I turn first to the sources I trust. Every baked good recipe by Dorie Greenspan, David Lebovitz, and Alice Medrich I have ever made has worked. Each of those folks -- as well as the dozens of other recipe writers I trust -- has done the work of baking, taking meticulous notes, and correcting mistakes so you don't have to make them. A good recipe is written well; it has to be more than just a series of ingredients and steps. You should be able to hear the recipe writer's voice in there, as though he or she is standing beside you, guiding you, standing back when you're doing fine but offering suggestions when something might feel confusing. If I read a recipe that tells me to bake the cookies for 15 minutes, but doesn't offer suggestions about the texture of the cookie or what it might look like to when it's done? I don't make it. Of course, you might want to make your grandmother's chicken pot pie or your uncle's famous snickerdoodles instead of turning to a cookbook. If it's written in shorthand, this is a great chance to have a family gathering and watch your grandmother make that pie with gluten. Write down everything you didn't know. Then go home and make it your own. Choose your recipe well and you're halfway there. I have written here before about the fact that many baked goods are equally good with gluten and without. It's really about getting the ratios right. Use too much of any flour and you're going to create an overly dense banana bread. So let's turn to the math. If you weigh out 1 cup of all-purpose flour, you will get…well, it will be different for every cup. Most recipe writers prefer you measure out a cup this way: aerate your flour by whisking it well, then spoon it into the measuring cup, and then carefully scrape off any excess flour with a knife. Or, if you bake anything like I used to bake, you probably just stuck that measuring cup into the bag of flour and scooped some out. The problem is that's a lot more flour than the recipe intended. A few years ago, when I started to bake by weight, I asked on Twitter for people to weigh out a cup of bleached white all-purpose flour, since that's the flour most baked goods use. The responses flooded in and they were all different -- I had answers from 4.2 ounces to 5.8. It all depends on how you measure your flour. But if you weigh your flours -- the way pastry chefs do -- every time you weigh out flour you will have the same amount. 140 grams will always equal 140 grams. 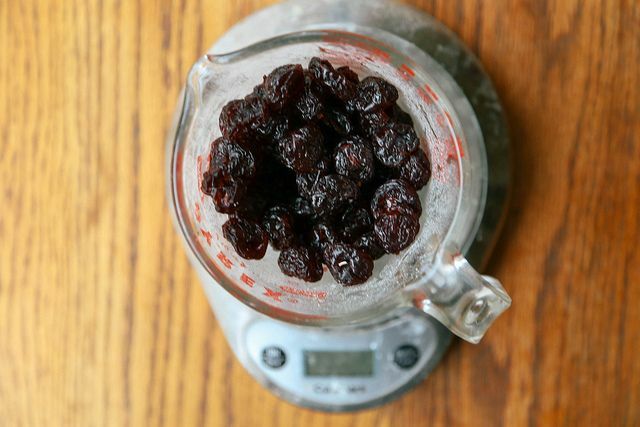 And it turns out that most recipe writers I trust, including David Lebovitz, use 140 grams as a standard weight for 1 cup of white all-purpose flour. You might see 125 grams sometimes. Or 130. Find the one that works for you. But in our house, we use 140. If you want to convert a recipe, simply, you're mostly done now. You need the right amount of flour and you keep everything else in the recipe the same. But I can only rarely stop there. I like to play with flours and their different flavors when I'm converting a recipe. Most times, it makes the recipe better. Here are a few that are tried and true -- there's more to baking than math, of course. • If you're making cornbread, throw in some corn flour with your gluten-free all-purpose flour. Once you convert the all-purpose flour to 140 grams of your flavorful gluten-free flours, then you play a little more. Does the dough feel a little dry? Try a splash of milk. Is it crumbling? Try an egg white or a whole egg. Is it missing some flavor? Try a pinch of salt. Or a little more cinnamon. And don't forget to take note of the changes for the next time you bake it. Make that recipe yours. It's not good enough for a recipe to be gluten-free. It has to be good. You can't go wrong with recipes on Food52. These recipes are crowd-tested and come from the best home cooks I know. So, when I wanted to convert a recipe, I turned to Merrill's oatmeal chocolate chip cookies. Here's how I made them my own. Hi Shauna, I'm new to gluten free baking (a personal choice although I do have family members with gluten intolerance) . My (once moist and lovely) muffin recipe isn't turning out the same now that I'm using a gluten free baking mix. I have found that the 2/3 cup of milk and 2/3 cup of oil,plus an egg don't moisten the batter anymore ... Looks and acts more like crumbs that have to be compressed into the tins ... HELP !! WOW! Thank you so much for the simple conversion! I discovered a red currant bush growing in our yard and I had no idea how to use all the berries. I found a muffin recipe but I needed to change it to gluten free flour and I'm so glad I found this post. I just used 140 grams of regular GF all-purpose flour and the muffins turned out delicious! :) I look forward to trying some of your other recipes since you obviously know what you're doing! :) Thanks! Hi GlutenFreeGirl! Great post - very helpful information. I just bought a kitchen scale and am excited to begin measuring my flour out correctly now. :) I do have a question about using coconut flour in recipes - it is a very different flour, so I assume it wouldn't be a 1:1 ratio for regular (or gluten free multipurpose) flours. Do you have a set weight for when using coconut flour in recipes or does it solely depend upon the recipe? I look forward to making your cookies! I love my cranberry bread recipe but want to convert it to gluten free so I can give it to someone who can't have gluten. I bought Pillsbury Gluten Free multi-purpose gluten free flour blend (rice flour, potato starch, pea fiber, tapioca starch and xanthan gum). Will this work as a substitute? Will I have to adjust or eliminate BP or BS? am trying to make gf-grain free pizza but i just dont know where to start with the flour, i have Bobs red mill Quinoa flour and i have coconut flour ? so where do i start to make the crust? Can I use vegetable oil instead of the butter to make cookies or biscuits, cause I got high cholesterol? Thank you very much for the advice. This helps me a lot. 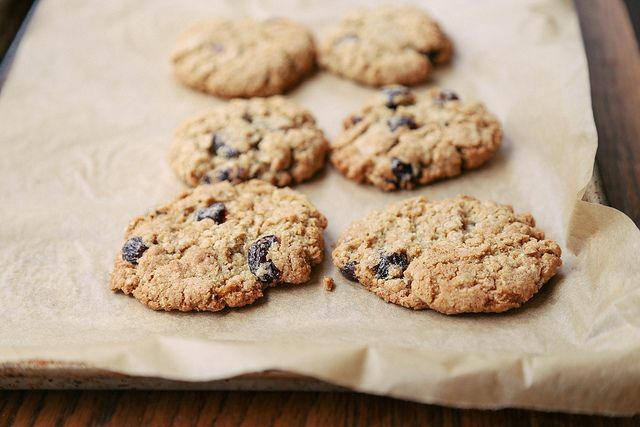 I also look forward to trying your oatmeal almond cherry cookie recipe! While I love Shauna's work (and her new cookbook), I think people new to gluten free baking need- need something to 'glue' it all together. For example, I recently made Wild Rice Cookies that literally fell to bits because there wasn't anything like xantham gum included in the ingredients to hold it together. Be aware folks! I have found that we don't need xanthan gum or any other binder if the ratio of flours to fats to liquids to eggs is accurate. In fact, in this recipe, the coconut flour works as a hydrocolloid, absorbing some of the liquids and holding the cookies together. So remember -- it's about the recipe! Hmmm interesting science at work. Is there any way tell beforehand - such as the inclusion of coconut flour - whether the ingredients will hold together or not without those additions = to ID a 'good' recipe? 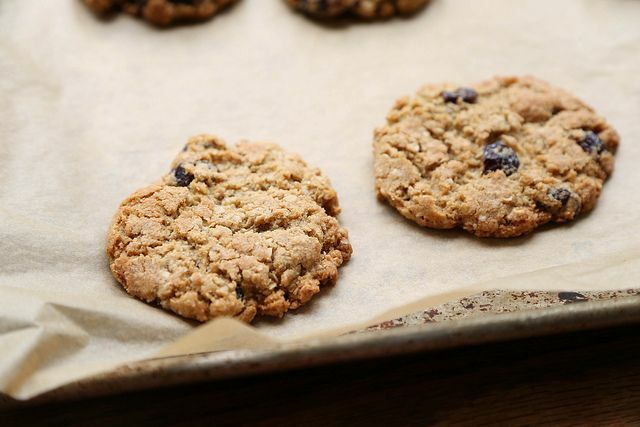 You don't need xanthan or guar gum in these cookies. I took those photos. These are the cookies from the recipe. "This one might be tough -- in the age of the internet, the first recipe that pops up from your search might not be a good one. It might be that the team that put it online did whatever necessary to make sure it shows up first in your search. Ever made a recipe online and blamed yourself when it turned out horribly? Don't. It might have been poorly written." It's not tough at all. Use Allrecipes.com. They have tens of thousands of recipes and a large GF section. Each recipe is reviewed by those who have already made it (removing further guesswork), sometimes by hundreds of users. Great resource. I think what Shauna is saying is just that there are plenty of not-so-great resources along with the great ones. It's just a warning to read and select carefully! I second the Allrecipes's gluten free section. I go by recipes that have many reviews that are well-written. Sure, in this day and age, people will sometimes puff reviews with fake feedback, but if a recipe has 30 reviews where it seems the majority actually MADE the recipe, I'll take a chance on it. GF flours cost too much money to waste them on a bad recipe! Now I feel that my worlds are truly aligning! Shauna Ahern is one of my wife's heroes as an example of how to thrive and continue to eat well and enjoy fine food in spite of having celiac disease. And as I am the chief cook and bottle-washer in our house, "The Gluten-Free Girl and the Chef" gets lots of work in our kitchen! I'm glad to see her on Food52. So happy to read this. We're glad to have her too!